I mean, if something is popular, that's great. Publishing is about supplying an audience with what they want. It's all good. 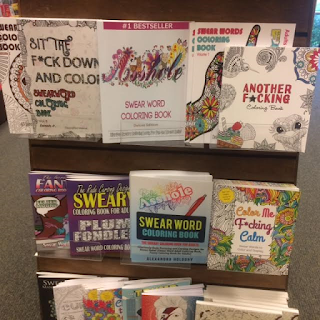 On the other hand when one end-cap holds eight different swear word coloring books, I do have the urge to roll my eyes. You know what drives me crazy? Those new adult coloring books. I suffer from migraines and it hurts to even look at them. I am not into adult coloring books, but I am more put off by how rudimentary and dull most of the pages in them are--from the few I picked up.